Emphasis will be placed on the development of good, sound baseball and softball skills without sacrificing the enjoyment and fun of playing the game. Our kids learn as much off the field as they do on the field. We believe this is because of the incredible players, the awesome coaches and more importantly the incredible support from our families and community. Please join WYBSL on June 3, 2018 for an exciting afternoon of fundraising where 100% of the funds go to field improvements, equipment, and reducing program fees. How does a Hit-A-Thon work? Players canvass friends, neighbors, and family members to sponsor them for the Hit-A-Thon. Pledges can be per hit or a flat donation, and should not include those who already contribute to WYBSL. Each player gets 10 strike-zone pitches. Tee-ball and younger will hit off a tee. Players earn funds based on each fair hit or a flat donation fee. Prizes are awarded for farthest hits by division, and most money raised individually and by teams. Who can participate in the Hit-A-Thon? 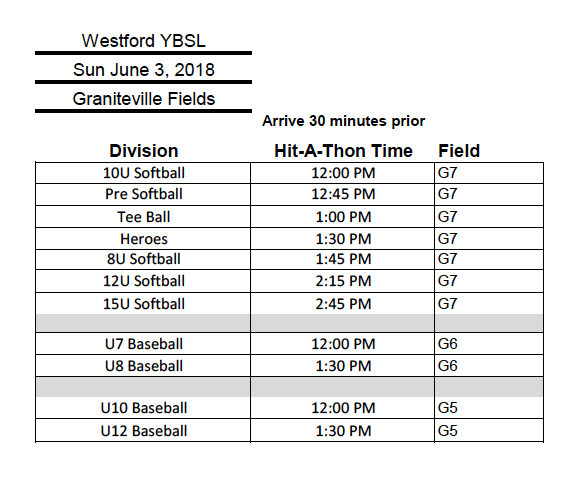 All registered players with WYBSL in Pre-Softball/Baseball, Tee Ball, Baseball and Softball are encouraged to participate. All registered players in Pre-Softball/Baseball, Tee Ball, Baseball and Softball are encouraged to participate. Who is going to be the pitching? Players in Tee-Ball or younger, will hit off of a tee. A coach or high school player will pitch to players 7 or older. How does the Hit-A-Thon event work? Teams/divisions will be assigned a time slot. Players will each get their pitches and their hits will be recorded. All participants will be able to earn extra raffle tickets by hitting targets on the field! Families are encouraged to stick around, there will be music, food, and other raffle items with winners selected throughout the day. How do I win prizes? What are the prizes? This year we will have several raffles. All Hit-A-Thon participants will be entered in our Premium raffles. One is for an iPad and the other is for tickets to a Red Sox Game! Additionally, we will have raffle tickets for sale for a variety of items including equipment, gift cards, and assorted toys. You have to attend to see the prizes! If you or your company would like to donate a prize or gift basket, we'd love to hear from you! Help raise funds for field improvements, equipment, and reducing program fees. My player cannot attend the Hit-A-Thon. Can they still participate? Absolutely! Your player can have their 10 pitches thrown by their coach at practice. 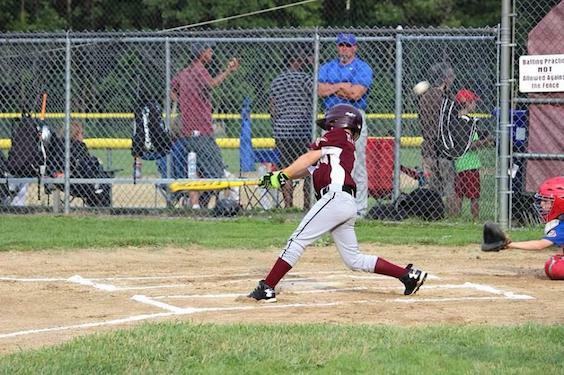 The pitches and hits need to be recorded by the coach and sent to the Hit-A-Thon Coordinator. This year’s goal is to see 100% participation. The more players who participate, the more fun we have - and the more money we raise, together! No amount is too small, and all are encouraged to come out and enjoy the day. Over the last 2 years we have raised a significant amount with only 20% of players participating each year. If each player raised only $5, we could easily exceed that amount and make a significant contribution towards a new complex! Our fundraisers and money raised through sponsorships have historically gone to fund two major initiatives: Keeping registration costs as low as possible as well as funding several enhancements to our complex each year. WYBSL has decreased the registration cost for all of our small diamond programs for the last three years. 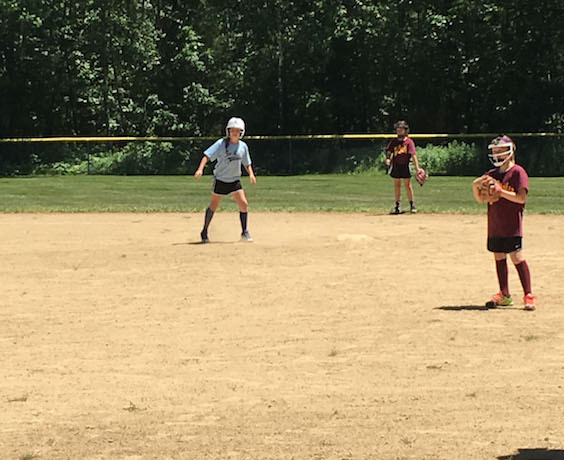 Moreover, we have been able to offer "learn to play" programs for both baseball and softball which we have been able to partially fund from monies raised through fundraisers. While those objectives will always remain in our goals, we have a new and exciting opportunity at the American Legion (most of you may know it as Graniteville) complex.